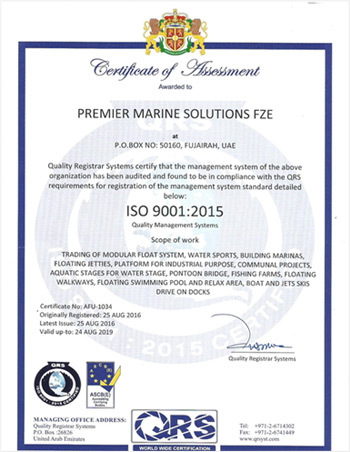 Premier Marine Solutions (PMS) is a family-operated business offering a variety of practical and unique marine products for various applications, from recreation and sports to aquaculture and water treatment plants. Since inception Premier Marine Solutions has worked with the sole objective of fulfilling all your marine needs, from design and construction to accessories and water sport recreational toys. We offer a wide range of products and services including custom floating dock design and construction, wood floating dock kits for the do -it- yourselfer, Aluminium Ramps and Dock systems, Boat lifts/Jet ski lifts, Marine plumbing, Lighting, Dockside accessories, Piling caps and all kinds of unique accessories for Docks and Piers. Today PMS is a market leader in the marine industry as all its products have long product life and long term economy as their key features. We have more than 10 years' experience in the marine industry and all our products are manufactured to ISO 9001:2000 standards, which ensures all our products, are manufactured with high quality. The superior quality products carefully designed and constructed in order to ensure maximum safety and stability. As all the products are resistant to UV rays, frost, seawater, corrosion, chemicals, and oil they are also extremely durable. Also the products are environment friendly as they are 100% recyclable. HDPE Material is used in their construction which renders them harmless to the environment. When you source from Premier Marine Solutions you have the added advantage that all the structures can be designed and installed to meet with your specific needs and requirements. We do have ready designed modules available & we can also tailor-make to suit your requirements. Electric and water works can be also installed if required. PMS has a full-fledged technical department composed of an experienced team of well-qualified professionals that provides high quality design services and after-sales services as well. All our products are manufactured in a way that the assembly and re-assembly is very easy & according to the quality of products, they are reasonable priced as well as colourful designs. PMS specializes in Modular Float Systems which are the best for leisure activities, water-sports and anything to do with water! Applications of PMS modular float system includes Marinas, Harbours, Jet Ski Docks, Drive on Docks, Floating Work Platforms used in industry, Communal projects, Aquatic stages for water shows and activities, Pontoon bridges, Fishing farms, Floating walkways, Bathers' play rafts, Bases of outdoor aquatic beer bars, Floating tents, Coffee shops, Rest shelters, or Floral decorative displays, Judge-stages for aquatic sport games, Aquatic life-guarding platforms, WE CAN MAKE ANYTHING FLOAT!. Our sole objective is to be a one-stop supplier for all your dock and marine needs from design to construction and accessories as well as offer a great selection of water recreational opportunities with our water sports product line. To provide customers with the products they want at prices they can trust! To conserve marine resources, reduce our impact on the environment, and promote boating.